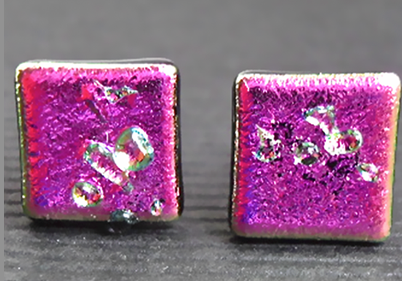 Very pretty small Pink Dichroic glass square stud earrings with sparkly pieces of clear glass on top. These earrings are very unusual. They measure 0.9cm x 0.9cm and are made of a layer Dichroic glass with a sprinkling of clear glass on top. The ear fittings are Sterling Silver.